We've all been at a party starting to wane around 3 or 4 a.m. when some party doctor puts Fela Kuti's "Roforofo Fight" on and injects pure energy into the night and causes the party to spill over into the next day. 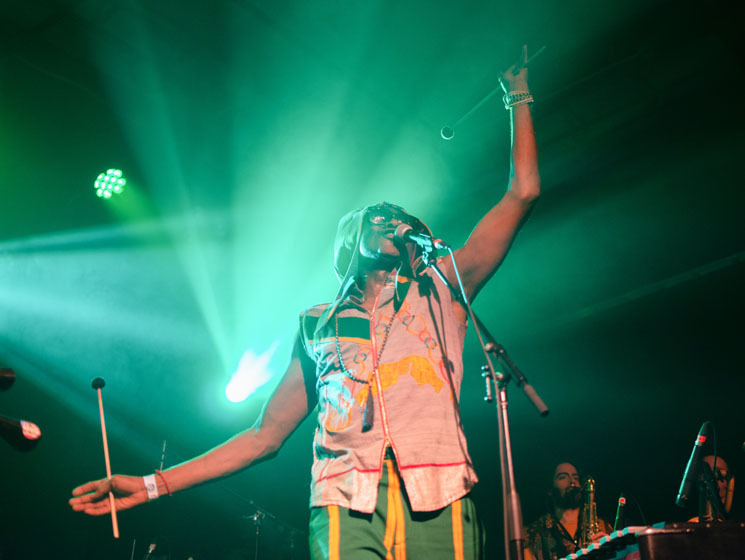 Antibalas channelled that same magic, rendering Edmonton's Starlite Room into a blisteringly hot, wall-to-wall sweaty dance party. The 12 members of Antibalas tested the confines of the relatively large stage, but a harder test was put to the soles on the bottom of any shoes bouncing off the floor from the contagious grooves the band locked into from the start. The largest parts of Antibalas's sound were bulletproof homage to Fela Kuti, but if you broke it down into layers, there were foundational elements of uptown funk and downtown jazz in the architecture. A fury of horns, unflappable percussion and relentless ardour from all 12 members kept the frenzy flowing for the full set. Antibalas and the fervour they inspired were the perfect antidote to a cold night.